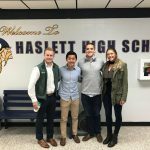 On Friday, October 5, 2018 senior FMI Scholars Niki Krear, Lewis Kordupel, Tim Sharky and Ethan Thomas visited with Haslett High School college-bound seniors interested in studying business. 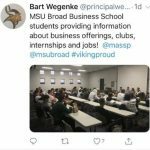 Welcomed by Principal Bart Wegenke and 2015 Milken National Teacher of the Year award recipient Kevin Tobe, the scholars spoke to students about the academic and extracurricular opportunities available at the Broad College of Business and within financial services more specifically. Tim is an alumnus of Haslett High. The Boeing 737 Max jet crashes inquiries should consider ethical dimensions behind business decisions.